1. Before you post ANYTHING, post an introduction in the Members Introductions area first. 1) Although the administrators and moderators of Cut-Weld-Drive Forums will attempt to keep all objectionable messages off this forum, it is impossible for us to review all messages. All messages express the views of the author, and neither the owners of Cut-Weld-Drive Forums, nor Jelsoft Enterprises Ltd. (developers of vBulletin) will be held responsible for the content of any message. 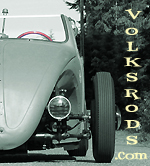 All members' personal information, website images and content, listed on or contained in Volksrods.com are private and protected. You are not welcome to use it for your own reasons, whatever they may be. We respect our members' privacy and WILL protect it. Do NOT test us on this.